In the first two blog posts of this series we discussed the need to thoroughly read through the CWI core documents (or playbooks); the AWS B5.1:2003 Specification for the Qualification of Welding Inspectors and the QC1:2007 Standard for AWS Certification of Welding Inspectors. These can conveniently be downloaded from the AWS website free of charge at http://www.aws.org/certification/CWI/. If you still haven’t read through these documents, and you are serious about becoming a CWI, close this blog post, download the documents and start reading. We will be here when you are done. For those of you who read through the documents, and have reviewed the structure of the exam as described in part 2 of this blog series, the next step in preparing for the CWI exam is to know what you are expected to know. The CWI Part A exam which tests the participants understanding of welding fundamentals is divided into fourteen subcategories as outlined in Section 7 of the B5.1 document. These fourteen subcategories each encompass a large quantity of information. For example, B5.1 states that the first subcategory, “welding processes”, makes up at least ten percent of the total number of questions in Part A of the exam. This is where the information from Part 1 and Part 2 of this blog post series comes into play. We know from last week’s post that Part A of the exam contains at least 150 questions. This means that at least 15 of those 150 questions will be on welding processes. As described in Part 1 of this blog series, Table 1 of the B5.1 document outlines general fundamentals of several welding, joining, cutting, and allied processes that a CWI must possess. The Knowledge and Skills section of Table 1 identifies SMAW, SAW, OFW, RW, GTAW, FCAW, GMAW, PAW, SW, ESW and Thermal Spraying, Soldering, Mechanical Cutting, Thermal Cutting/Gouging, Brazing/ Braze Welding. When this information is combined with the information from Section 7 we can paint a clearer picture of the information covered on Part A of the CWI exam. Further examining Section 7 identifies Cutting as making up a minimum of three percent of the exam outside of welding processes; brazing making up a minimum of two percent, and soldering making up at least another one percent. 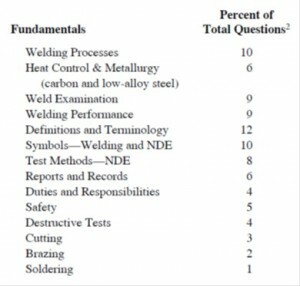 When combined with the “welding processes” category, the Knowledge and Skills section of Table 1 identifying SMAW, SAW, OFW, RW, GTAW, FCAW, GMAW, PAW, SW, ESW and Thermal Spraying, Soldering, Mechanical Cutting, Thermal Cutting/Gouging, Brazing/ Braze Welding actually makes up sixteen percent of the total questions in Part A, or approximately 24 of the 150 questions. One of the most common mistakes made by individuals studying for the CWI is making false correlations when looking at this information. 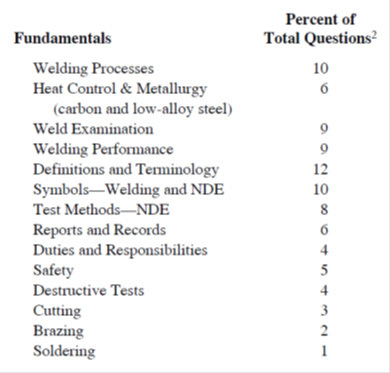 Test takers sometimes assume that because the information outlines fifteen different welding and allied processes and because the test contains a minimum of 24 questions on welding processes, that there will be at least one question on each of the listed processes. This of course would be a misrepresentation of the information. The questions on the CWI exam can come from any of the listed capabilities, knowledge, or skills listed on Table 1 of the B5.1, meaning that you may receive an exam in which all fifteen of the questions come from a handful of those welding processes. Each knowledge or skill outlined in Section 7 indicates the minimum number of test questions on that section of the exam as a percentage of the total. For example, a minimum of 10 percent of the questions will be on Welding Processes and a minimum of 6 percent of the questions will be on Heat Control and Metallurgy. When you add up all of the exam categories identified in B5.1 for Part A, you get 89 percent. This means that an additional 11% of the total number of questions can come from any of the categories listed. In other words, the list below shows the minimum percentage of questions, not the total percentage. For instance, a minimum of 10 percent of the questions in Part A of the exam will be on Welding Processes. However, there may be additional questions on Welding Processes because it may be chosen as one of the categories from which the final 11% of the questions are selected. The combination of the information in Table 1 and Section 7 of the B5.1 document provides a clear indication of the catagories and section weight on the total exam. Next week we will discuss how this information will help you create a study plan for the CWI exam. I was in search of this.